This Cashew Honey Soy Salmon post is sponsored by McCormick. All opinions are my own. 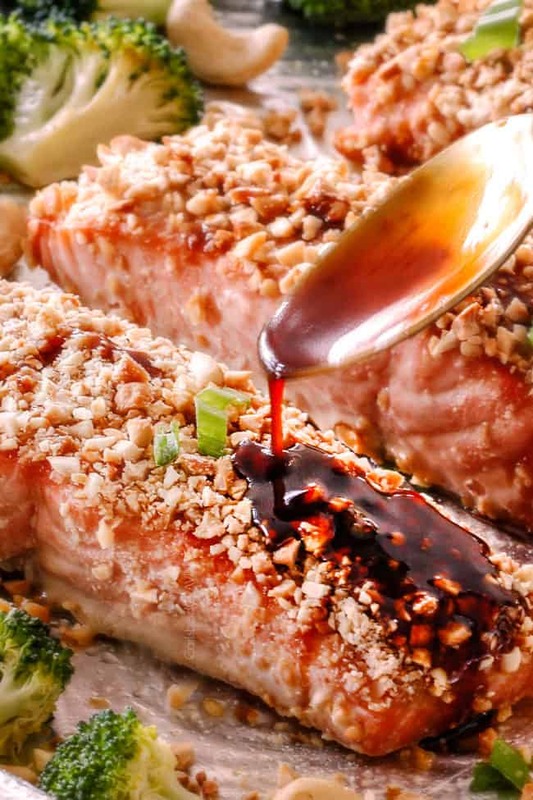 Cashew Honey Soy Salmon is tender and juicy on the inside, crusted in crunchy, buttery, roasted cashews on the outside, and drizzled with to-live-for Honey Soy Glaze all over. This Sheet Pan Cashew Honey Soy Salmon tastes deceptively gourmet but is actually wonderfully easy! 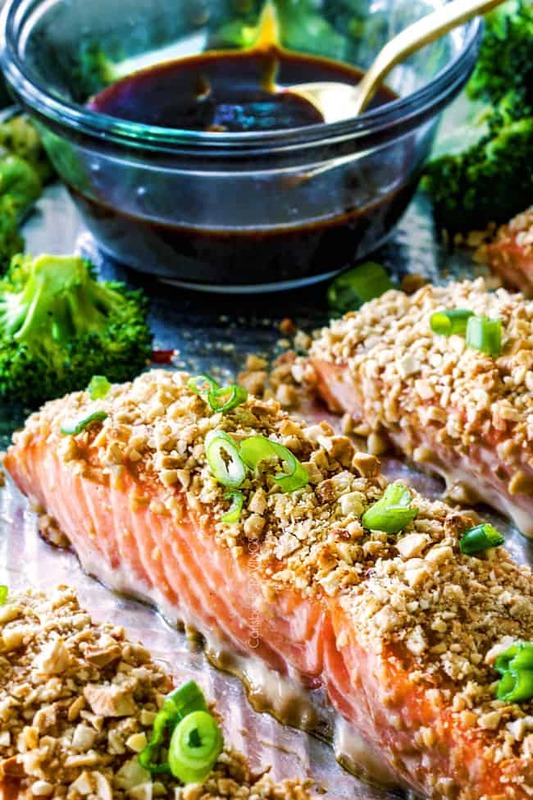 The salmon is roasted to perfection WITH broccoli so you have a healthy, protein-packed, quick and easy meal-in-one with hardly any clean up! You guys, I am so in love with the flavor, texture and ease of the Sheet Pan Cashew Honey Soy Salmon. I actually devoured a portion until I thought I was full but I couldn’t stop craving its crunchy, rich, buttery deliciousness, so I went back 30 minutes later for more! This Honey Soy Salmon recipe is delectable all on its own but then it gets drizzled with the Honey Soy Glaze (that’s also the marinade- no double work) that is sweet, salty, tangy and almost more delicious than I know what to do with. 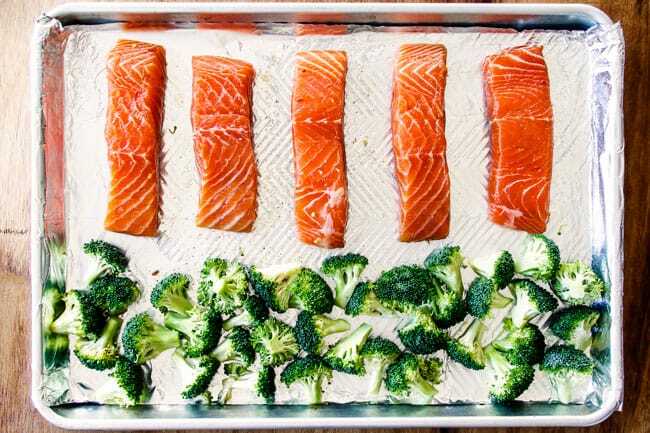 This is one baked salmon that doesn’t sacrifice on flavor or texture and might just become your new “go-to” favorite Sheet Pan recipe! I get giddy over sheet pan meals because it usually means a meal-in-one with no additional sides to prep AND less dishes in the process – yes PLEASE! I’ve been working on building up an arsenal of easy dinners that taste completely gourmet without feeling like a chore to make like my Sheet Pan Lemon Butter Garlic Shrimp and Asparagus, Sheet Pan Chili Dijon Pork Tenderloin with Potatoes and Green Beans, Sheet Pan Honey Mustard Pretzel Chicken & Potatoes and now we can add this Sheet Pan Cashew Honey Soy Salmon to the top of the list. 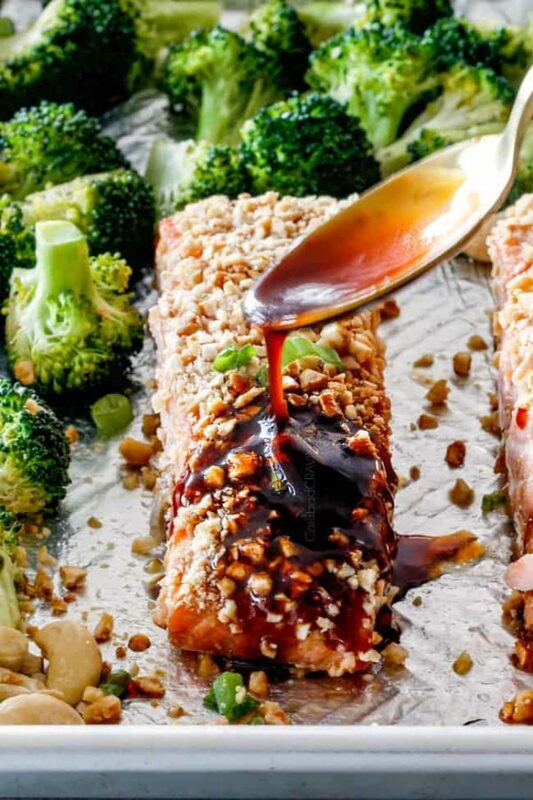 No Double Work Marinade/Sauce: To make this Cashew Honey Soy Salmon, we first marinate our salmon for 30-60 minutes in a concoction of soy sauce, honey, Asian sweet chili sauce, rice vinegar, hoisin, Asian hot chili sauce and McCormick Ground Ginger, McCormick Onion Powder and McCormick Garlic Powder. This sauce will become our marinade AND our glaze so this is all the whisking we have to do – no double work! 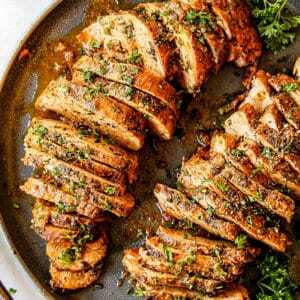 Marinate for More Flavor: Many sheet pan fish recipes don’t marinate the fish/chicken, but I find this leaves all the flavor on the outside instead of infusing the fish with flavor from the inside out – we want our Honey Soy Salmon to actually taste like honey soy salmon. The combination of honey and soy creates a sweet and salty flavor that seeps into the salmon for ultimate palate pleasing pleasure. Plus, while your fish is bathing in the marinade, you can prep your broccoli and chop your cashews, so it really doesn’t require any extra time. Season Broccoli: Next, we add our broccoli to a foil lined, greased baking sheet for easy cleanup. 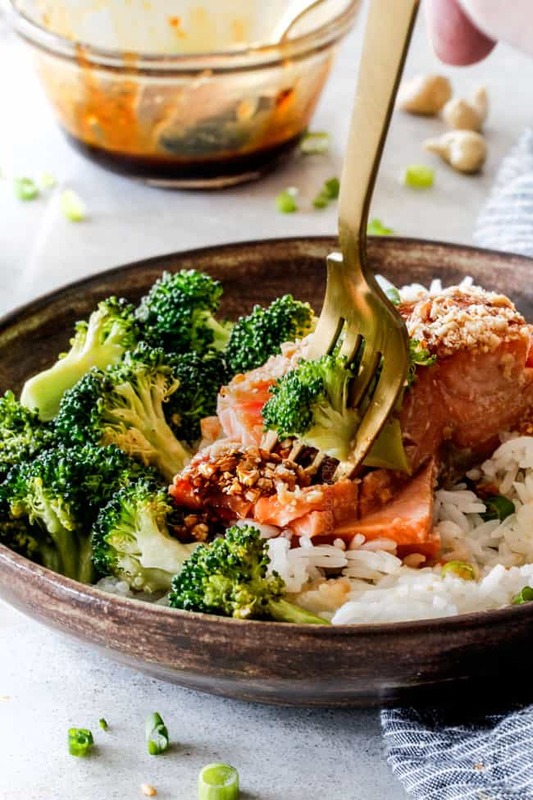 Toss the broccoli with olive oil, 1/2 tablespoon of our Honey Soy Marinade, salt and pepper then push the broccoli to one side of the pan to make room for the salmon. Cashew time! Make sure your cashews are UNSALTED. If your cashews are salted then your salmon will be too salty from both salty cashews and salty soy sauce. I personally like to roast my whole raw cashews prior to chopping for even more flavor but that is completely optional. If you decide to roast your cashews, then spread them into a single layer on a baking sheet and roast at 400 degrees F for approximately 7 minutes, stirring occasionally. To chop your cashews, you can do it by hand or use your food processor for super quick chopping. Crust that Honey Soy Salmon: Next, we remove our salmon from the Honey Soy Marinade and pat it dry with paper towels. 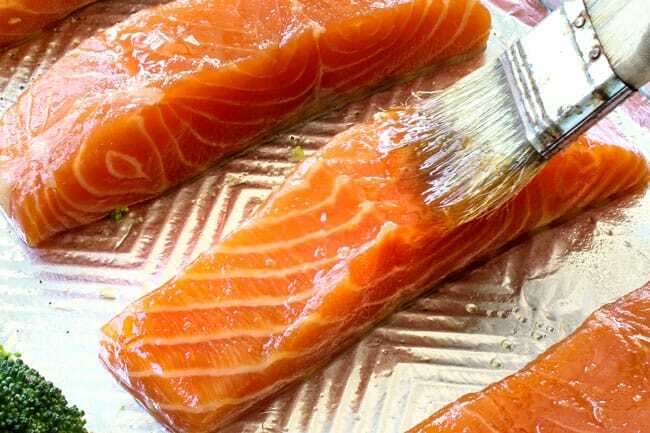 Brush the tops of the salmon with approximately 1 tablespoon honey (total). You don’t need a lot of honey – it is acting more as glue for our cashews than for flavor. Push this honey side into the cashews then turn your salmon over and top/push additional cashews into any spot that needs it. 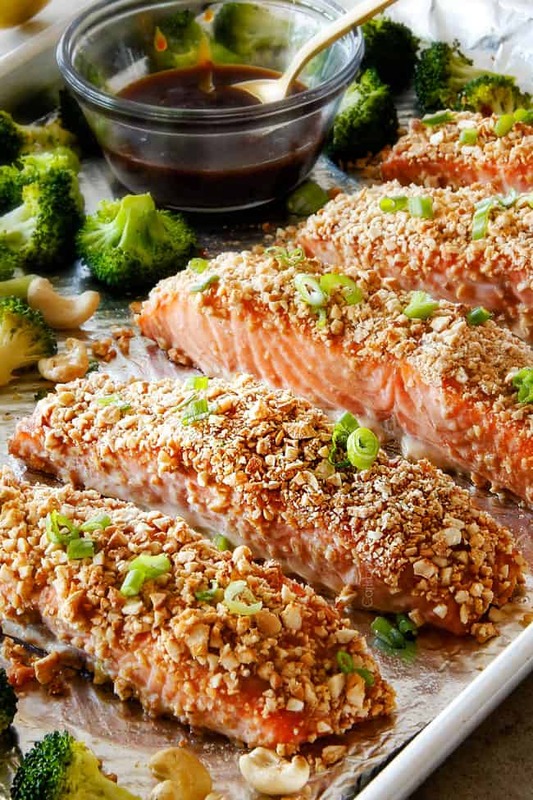 Place salmon next to broccoli in a single layer. Roast: Bake for 12-15 minutes or until the salmon is cooked through and flakes easily with a fork. 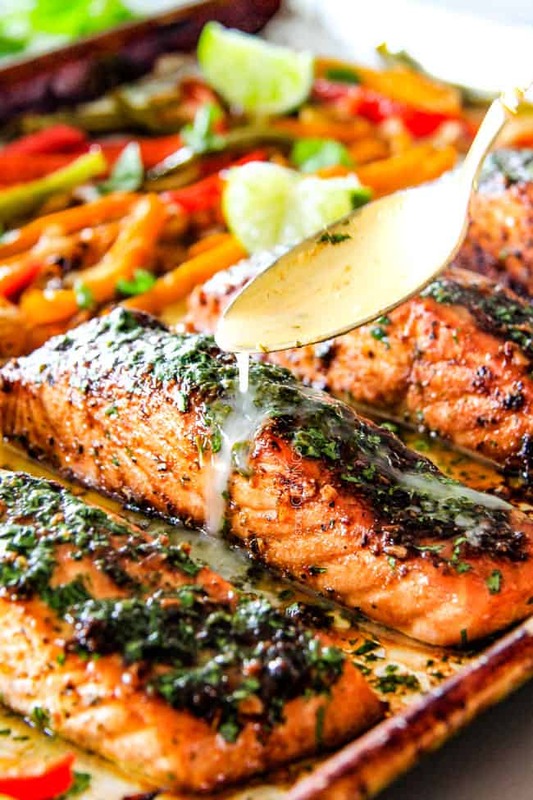 Cooking time will vary depending on the size and thickness of your salmon fillets, typically 4 to 6 minutes for every 1/2-inch thickness of salmon. 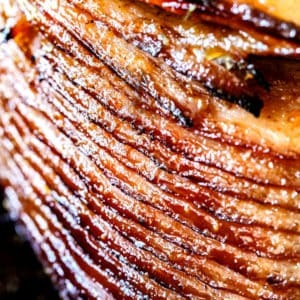 An instant-read thermometer inserted into the thickest part of the fillet should read 120°F to 130°F for medium-rare or 135°F to 145°F for more well-done. I personally find salmon more tender when it’s cooked for less time, so I prefer 12 minutes. Honey Soy Glaze: Now the crowning glory of our already delectable Cashew Honey Soy Salmon – the Honey Soy Glaze! This glaze takes no more than 3 minutes to make and it tastes like liquid gold. Wait to simmer your Glaze until your salmon only has a few minutes left to bake, that way it won’t get to thick. To make the Honey Soy Glaze, add the remaining Sauce (that you didn’t use in the marinade) to a small saucepan. Bring to a simmer until thick enough to coat the back of a spoon (about 2 minutes) then add 1 tablespoon butter. Melt butter over medium heat. If you want your glaze thicker, simmer longer. If Honey Soy Glaze gets too thick then stir in some water to reach desired thickness. EAT! Serve Salmon with the ridiculously delectable, sticky sweet, savory Honey Soy Glaze. If you want the cashews to stay crunchy, serve the glaze on the side. I love this Cashew Honey Soy Salmon with jasmine rice but it would also be fabulous with brown rice, quinoa, etc. 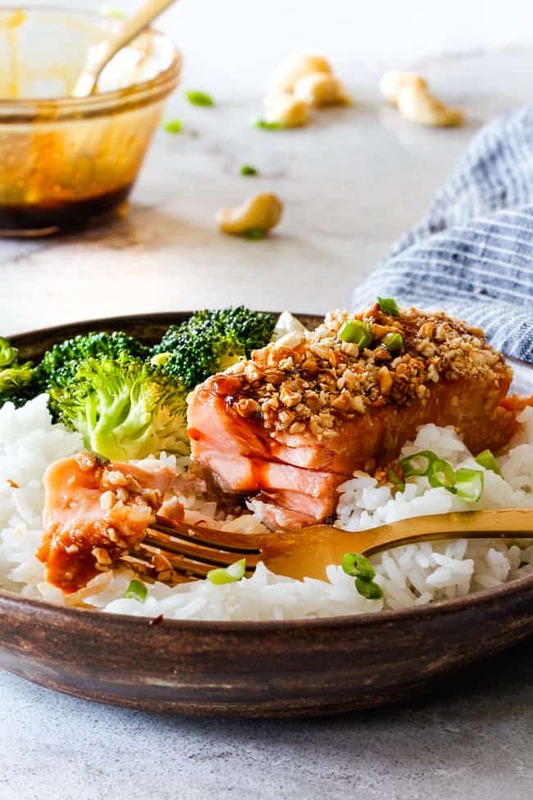 With one bite, you will be jaw-dropping-wowed this multidimensional, flavor bursting, texture exploding Cashew Honey Soy Salmon because easy CAN equal delicious thanks to McCormick! 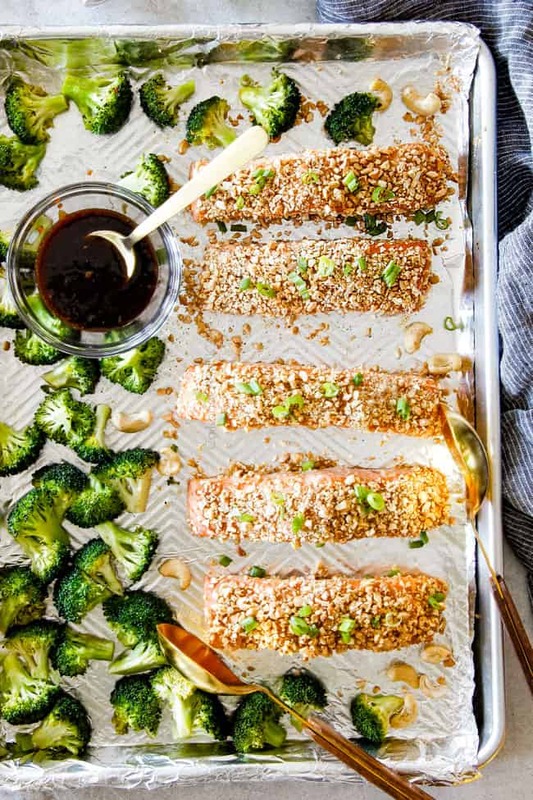 Want to try this Sheet Pan Cashew Honey Soy Salmon Recipe? 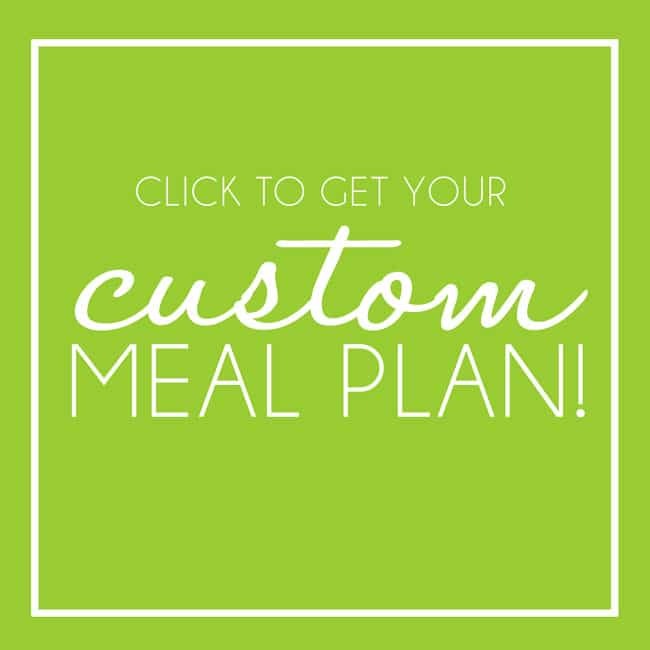 Pin it to your FISH, SHEET PAN, ASIAN or DINNER Board to SAVE for later! This Sheet Pan Cashew Honey Soy Salmon is a MEAL IN ONE that looks impressive but is SO easy, crazy delicious and healthy! 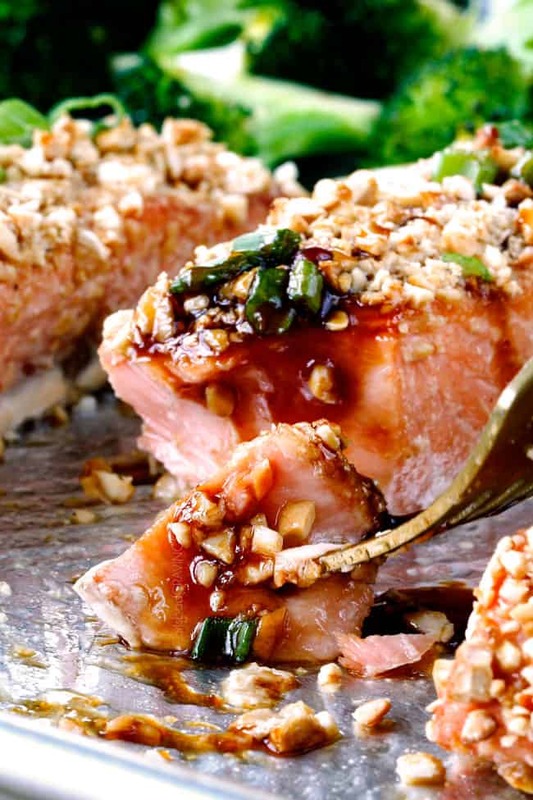 The Honey Soy Salmon is tender and juicy on the outside, crusted in crunchy, buttery, roasted cashews on the outside, and drizzled with to-live-for Honey Soy Glaze all over! 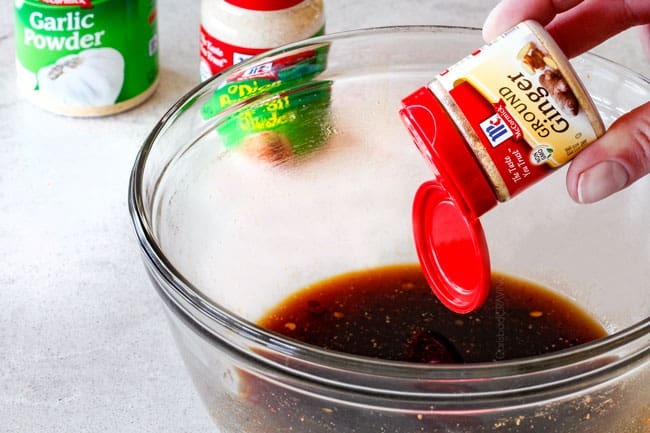 Whisk together the Honey Soy Sauce ingredients in a medium bowl. Remove ¼ cup to a shallow dish or plastic bag. Add salmon and let marinate 30-60 minutes at room temperature. Meanwhile, line a baking sheet with foil. Spray with nonstick cooking spray. Add broccoli and toss with 2 tablespoons olive oil, 1/2 tablespoon Honey Soy Sauce, 1/4 teaspoon salt and 1/8 teaspoon pepper. Push into a row on the left side of the pan in a single layer. Remove salmon from marinade and pat dry with paper towels. Brush the tops of the salmon with approximately 1 tablespoon honey (total) then push this honey side into the chopped cashews. 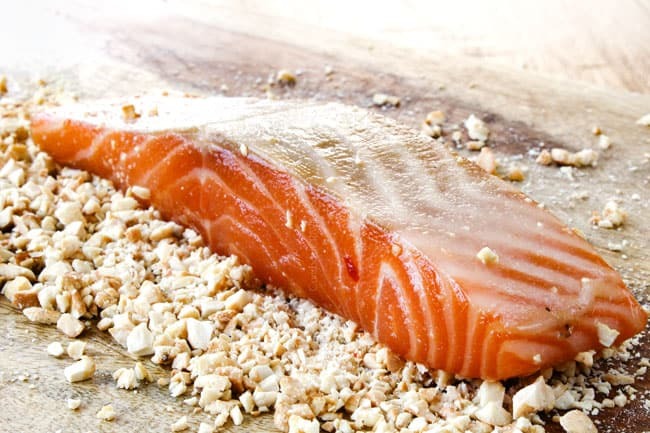 Turn salmon over and top/push additional cashews into any spot that needs it. 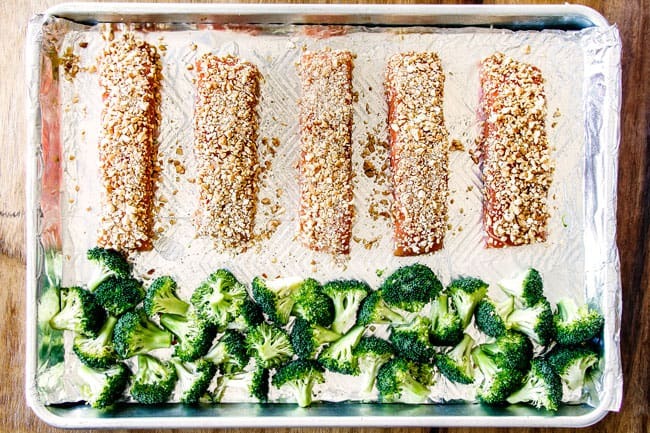 Place salmon next to broccoli in a single layer. When your salmon only has a few minutes left to bake, begin your Honey Soy Glaze (so it doesn’t get too thick upon standing). Add the remaining Sauce (that you didn’t use in the marinade) to a small saucepan. Bring to a simmer until thick enough to coat the back of a spoon then add 1 tablespoon butter. Melt butter over medium heat. If you want your glaze thicker, simmer longer. If it get’s too thick then stir in some water to reach desired thickness. Serve Salmon with Honey Soy Glaze – a little goes a long way! If you want the cashews to stay crunchy, serve the glaze on the side. *I like to roast my raw cashews before chopping for even more flavor. Roast at 400 degrees F for approximately 7 minutes, stirring occasionally. You can chop your cashews in your food processor for super quick chopping. 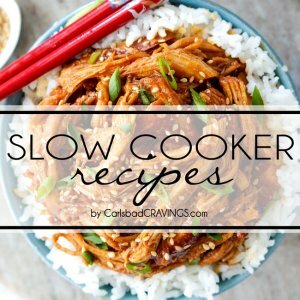 I am so excited for this recipe Jen! 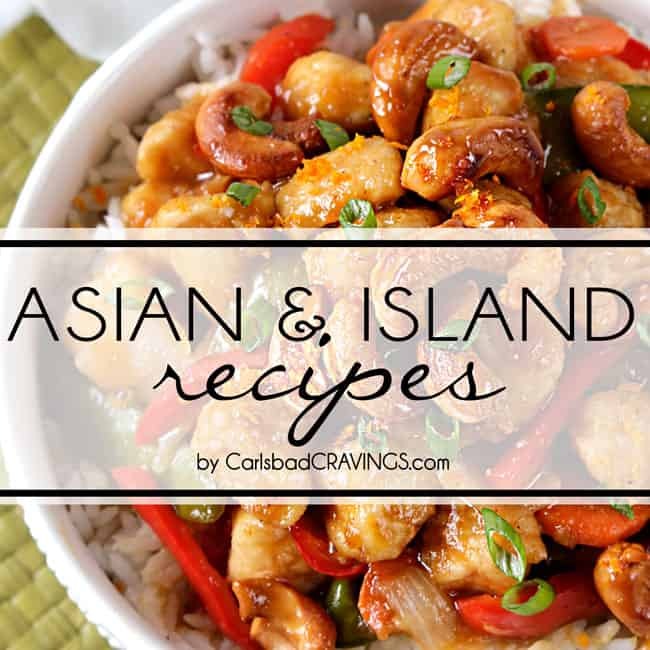 Sheet pan, honey soy and cashews?!! 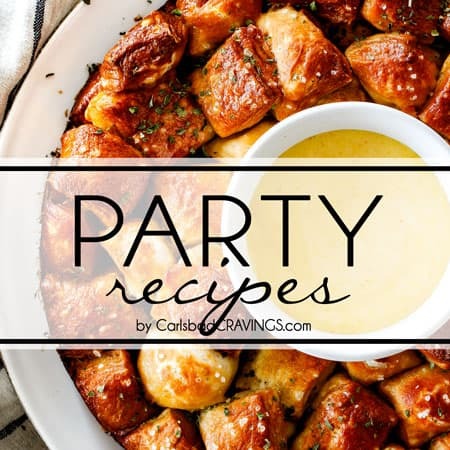 Your recipes never disappoint! You are so sweet Sam, thank you! It really is a dynamite combo! I hope you can make it soon! 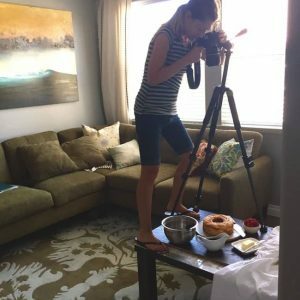 I don’t know how you keep coming up with such amazing recipes. 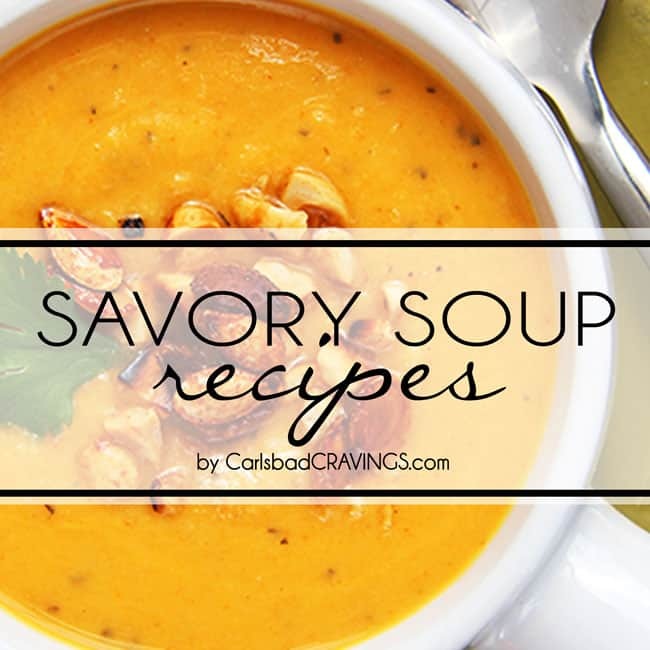 My family has loved every single recipe of yours we’ve tried. Making this on Monday! Your comment makes me so happy! I LOVE hearing your family is enjoying my recipes! Thank you for making my recipes and for taking the time to make my day! Hi there. I am a new follower. I found your site on Pinterest and just made your lemon garlic butter salmon and both my husband and I agreed it was the best salmon we’ve ever had! Can’t wait to try this one too. 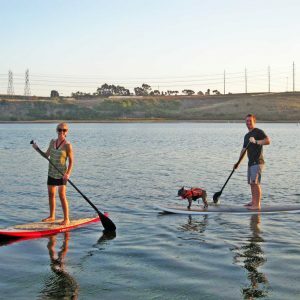 Welcome to my site Katie! I’m thrilled you tried and loved the Lemon Garlic Butter Salmon – that is one of my absolute favorite recipes! I really think you’ll love his one too! Can’t wait to hear what you think! 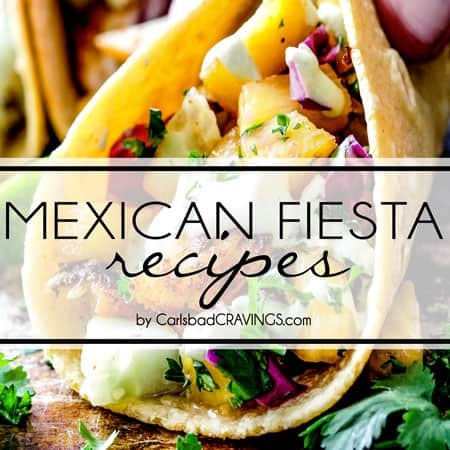 I hope you have fun exploring my site and trying new recipes! Another beautiful, beautiful surprise ! Thank you ! Just made this last night and both my husband and I agreed it is one if the best salmon recipes we have ever had- and surprisingly easy too! Thank you for another home run! YAY! I’m thrilled and honored it was one of the “best salmon recipes” you’ve ever had! Thank you for making my day! I never leave comments, like ever. But seriously every single recipe I have made from your website has been fantastic. 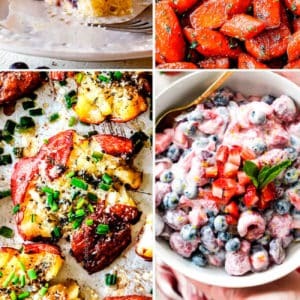 I used to go on Pinterest to look for weekly recipes for my family, but now I just go straight to your website. 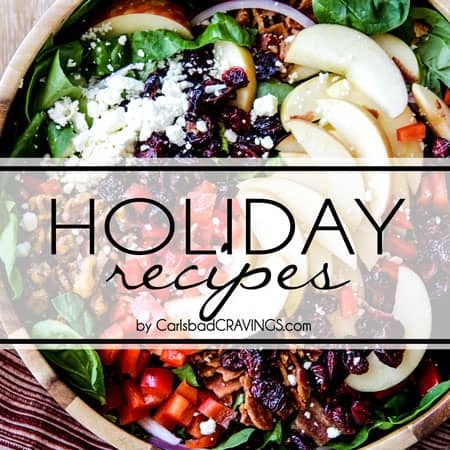 Thank you so much for sharing your wonderful recipes with us! Thanks Stephanie for your super thoughtful comment! 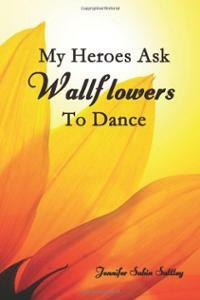 I am so honored you are loving my recipes so much, that makes my day, my month! I hope you continue to find many new favorites! You’re so welcome, I’m so pleased you enjoyed it!